Bitzer Part-No Supply Order No. The OLC-D1 optical monitoring unit is used for contactless monitoring of the liquid level. This is accomplished by a screw-in unit installed at the measuring point for optical level scanning as well as an electronic, removable evaluation unit. The evaluation unit can be replaced without opening the reservoir of the monitored media. The relay trips 3 seconds after connecting the supply voltage. If no level is detected the relay switches off after a delay, the red LED illuminates. If the level reaches the good range, the relay picks up again after a delay, the red LED goes out. The own monitoring system of the optics integrated into the OLC-D1 ensures increased operational reliability. An installation check monitors the proper assembly. If there is a fault, the relay switches off after a delay, the red LED illuminates. The relay activates 3 seconds after connecting the supply voltage. If low level is detected the relay switches off after a delay, the red LED illuminates. If the level reaches the normal range, the relay picks up again after a delay, the red LED goes out. 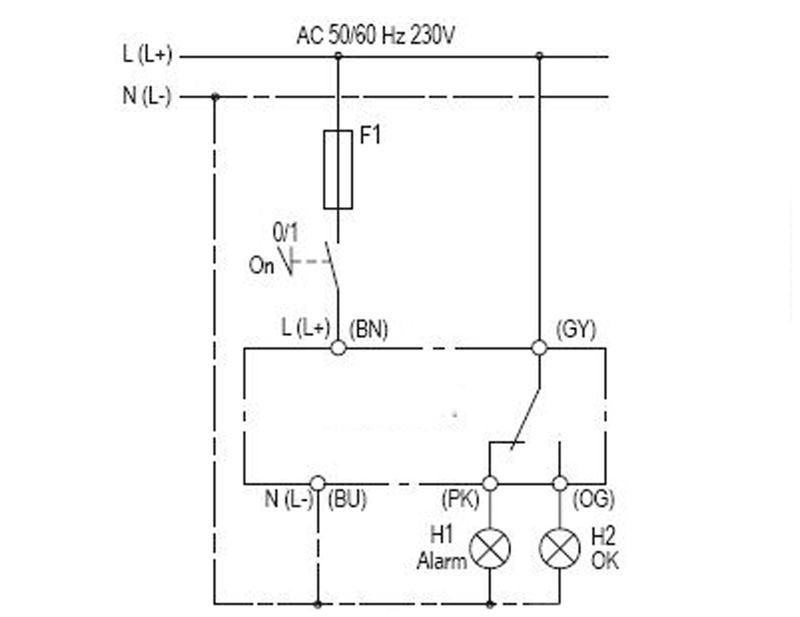 The relay switch output is designed as a potential free change-over contact without an auxiliary relay. The own monitoring system of the optics integrated into the OLC-D1 ensures increased operational reliability. An installation check monitors the proper assembly. If there is a fault, the relay switches off after a delay, the red LED flashes.